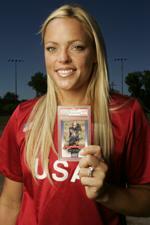 Sports trading cards personally autographed by USA Softball Women's National Team star pitcher, Jennie Finch, have officially been released for sale to the public. Finch, of LaMirada, California, is a member of the U.S. team that begins its quest for a third consecutive gold medal in the Athens Olympic Games on August 14. The autographed cards have been certified by Professional Sports Authenticator (www.psacard.com), a division of Collectors Universe, Inc. (NASDAQ: CLCT), Newport Beach, California, the world's largest third-party authentication service for autographs and collectibles. The limited edition, autographed rookie cards are available online at www.softballoutlet.com and www.beckett.com. "Jennie Finch already is one of the most famous female athletes in the world," said Joe Orlando, PSA President. "She recently autographed some of her limited edition rookie cards produced by Upper Deck in 2002 for USA Softball's World Championship trading card sets. They have been certified by PSA as authentic signatures, and the cards have been encapsulated in protective, tamper-evident holders for collectors," explained Joe Orlando, PSA President. Finch was named the top collegiate softball player and Pac-10 pitcher of the year in 2001 when she pitched at the University of Arizona. She won gold medals at the 2002 International Softball Federation World Championships and the 2003 Pan American Games, and now is on the U.S. women's Olympic team that will compete for the gold in Athens, Greece. "We selected PSA to certify the autographs because they are the gold standard in sports collectibles authentication," said Kelly McKeown, Director of Marketing for the Amateur Softball Association (ASA), based in Oklahoma City, Oklahoma. "This is a new venture for us and we're excited to make this product available to sports card enthusiasts around the world. It worked out well that Jennie's rookie card happened to be part of a set produced by Upper Deck back in 2002. Between the PSA and Upper Deck brands, we certainly feel like this product will generate excitement in the marketplace," said McKeown. Orlando, who also is editor of the monthly Sports Market Report magazine, predicted there will be significant interest in Finch's autograph. "The number of available, authenticated Finch autographs in the marketplace is small in comparison to the demand for her signature. When you consider this new product combines her highly sought-after autograph with her own rookie card, it makes for a great collectible. And the PSA certification helps provide peace of mind to potential buyers who want to make sure they are purchasing the real thing," Orlando explained. Founded in 1933, the Amateur Softball Association (www.asasoftball.com) is the national governing body of softball in the United States and a member of the United States Olympic Committee. The organization has more than three million members and more than 240,000 teams and 40,000 umpires. USA Softball (www.usasoftball.com) is owned and operated by ASA, and is responsible for training, equipping and promoting the USA Men's, Women's, Junior Boys' and Junior Girls' National Softball Teams.